Feel instantly welcomed as you receive a freshly baked chocolate chip cookie the moment you step into the former iconic Fort Shelby hotel. The hotel has been restored to its former glory with a modern edge to create the DoubleTree Suites by Hilton Hotel Detroit Downtown - Fort Shelby. Located just a few blocks from the business and financial district the hotel is just a 25-minute drive from Detroit Metropolitan Wayne County Airport /DTW/. Our friendly shuttle drivers will be happy to take you to nearby downtown attractions and the conveniently located Detroit People Mover Fort/Cass station is just one block away. 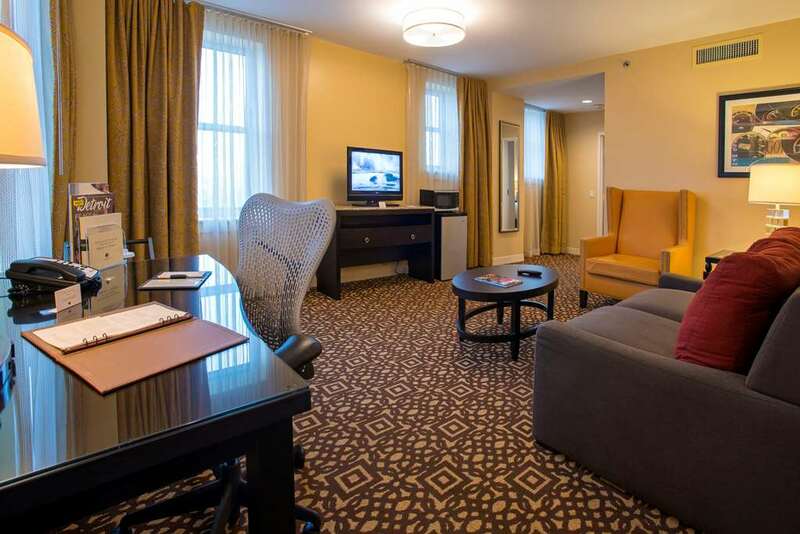 Make yourself comfortable in a spacious and modern suite offered as standard with thoughtful amenities like complimentary internet access a 32-inch LCD HDTV and separate areas for sleeping and living. This downtown Detroit hotel is ideal for families providing plenty of space with the pull-out sofa bed in the living room. Experience regional and local favorites in Motor City Kitchen restaurant and try a refreshing drink in the trendy Round Bar. Home to the only IACC-certified conference centers in downtown Detroit our hotel provides an expert team and 21 000 sq. ft. of space for your next event. Motor City Kitchen: Enjoy an urban twist on comfort food. Enhanced local favorites with changing seasonal fare.Relax in a casual surrounding and soak up Detroit*s culture. Available for private party needs. Motor City Market: Visit our contemporary coffee cafe pouring gourmet coffee offering delicious pastries - sandwiches and complimentary WiFi. Fresh breakfast food and grab-and-go sandwiches available. News stand with current periodicals and major daily newspapers available. Round Bar: Offering a nonstop bar with innovative cocktails and select wines. In addition 16 beers on tap that change often to give you lots of local taste. Friendly service that keeps the energy coming. Dive into something fresh..
In-Room Dining: Relax in the comfort of your luxurious guest suite and choose from a variety of delicious menu options from your in-room dining menu without even leaving your room. Just pick up the phone. Enjoy.